Focus: A point related to the construction and properties of conic sections. In geometry, a focus is a point related to the construction and properties of conic sections. A circle and a parabola have one focus. The focus of a circle is also center of the circle. Sometimes, it is convenient to talk of a circle having two coincidental focuses, meaning two focuses that occupy the same point. Similarly, a parabola is sometimes considered to have a second focus at infinity. 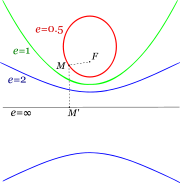 An ellipse and a hyperbola both have two focuses. McAdams, David E.. Circle . allmathwords.org. All Math Words Encyclopedia. Life is a Story Problem LLC. 3/12/2009. http://www.allmathwords.org/en/c/circle.html. McAdams, David E. Focus . 12/21/2018. All Math Words Encyclopedia. Life is a Story Problem LLC. http://www.allmathwords.org/en/f/focus.html. Focus: Seahen, commons.wikimedia.org. This work is licensed under the GNU Free Documentation License, Version 1.2. https://commons.wikimedia.org/wiki/File:Excentricidad.svg.